How do you shed 30 pounds or more off your 5th gen Camaro without permanent modifications or voiding your warranty? Install one of SMG’s rear seat deletes! The Factory leather seats weigh in at approximately 40lbs, add in the weight of the seat belt assemblies and you are likely pushing 52lbs! The Skid Mark Garage 5th Gen seat delete kits weigh just a svelte 11lbs! 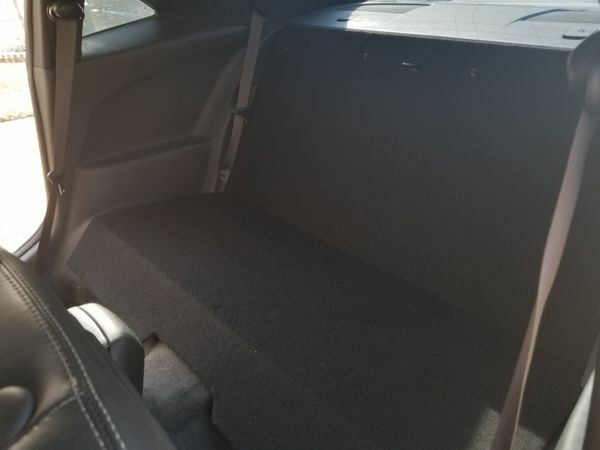 Not only functional in saving the most weight of any commercially available kit for your 5th gen Camaro, but can serve as a light duty parcel shelf too. Kit includes all necessary hardware supplied and no special tools are necessary unless you are removing the seat belts re-tractors. Installation takes approximately 10 minutes so you can pop it out for track days and easily pop the seats back in for street duty in no time. Innovative folding one piece design makes it a snap to install and store for later use. 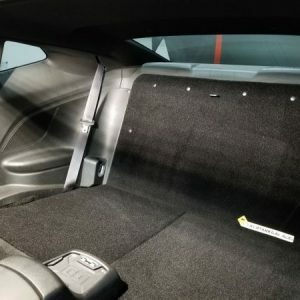 *Our seat delete kits are custom handmade to order out of automotive grade materials, our composite core is light and strong however its main purpose is to shed weight and IS NOT a weight bearing package shelf. It is not designed to support weight great than that of a simple gym bag or helmet. These are hand made to order so please expect 5-7 days assembly and processing time before the item ships from here in Southlake, Texas. Due to size bulk shipping rates apply.